CHICAGO — Everything changed for the Chicago Cubs on a rainy November night. A century-plus worth of heartache washed away by a wave of pure joy. There were hugs, cheers and tears — and bottles and bottles of booze, sprayed everywhere from Cleveland to the shadow of Wrigley Field. Lovable losers, no more. The story of so many lifetimes is The Associated Press' Sports Story of the Year. "The burden has been lifted," manager Joe Maddon said. The Cubs' first World Series title since 1908 is the runaway winner for top sports story of 2016, collecting 48 of 59 first-place votes and 549 points in balloting by AP members and editors. The death of Muhammad Ali after a long battle with Parkinson's disease was second with 427 points, and LeBron James leading the Cleveland Cavaliers to the franchise's first NBA title took third with 425 points. In a year that seemed to be more about what we lost (Ali, Arnold Palmer, Gordie Howe, Pat Summitt, Jose Fernandez and the plane crash that killed most of the Brazilian club soccer team Chapecoense) than the winners on the field, the Cubs provided a feel-good moment that warmed at least the north side of Chicago well into the city's notoriously brutal winter. They drew huge ratings throughout the playoffs, with much of the country tuning in to see if it finally was the year. "I think a lot of casual fans were initially drawn to the Cubs in the postseason because of the 108-year drought and the curse narrative," president of baseball operations Theo Epstein said. "But when they tuned in, they saw a talented team full of young, exciting players who are also team-first, high-character people." 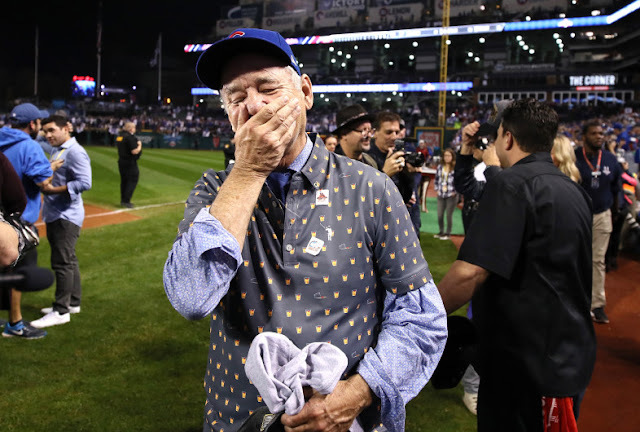 As baseball stories go, the 2016 Cubs had it all. One last stand for David Ross, a retiring catcher who became a key figure in Chicago's clubhouse. Loads of bright young stars, with Kris Bryant turning in an MVP performance. An eccentric personality in Maddon, who cemented his status as one of the game's best managers. There was history, for the franchise and its front office, with Epstein helping end two of baseball's biggest droughts. See Boston Red Sox, 2004. That would have been enough to make it one of the top sports stories of any year, but an epic finish only added to the luster of the franchise's third championship. The Cubs dropped three of the first four games in the World Series against the Indians, and then rallied to force Game 7 in Cleveland. After Chicago blew a 6-3 lead in the finale, outfielder Jason Heyward got his teammates together during a short rain delay before the top of the 10th. The Cubs caught their breath, and then finished off the famed Billy Goat Curse with an 8-7 victory that will live on in the bars of Wrigleyville for many years to come. "The players-only meeting during the rain delay was emblematic of this team," Epstein said. "Instead of lamenting the blown lead or pointing fingers, the players rallied around one another and picked each other up." Ali was mourned all over the world after his death in June at age 74. President Barack Obama called his wife, Lonnie, to express his condolences, and a public memorial in the boxer's hometown of Louisville, Kentucky, drew an eclectic mix of celebrities, athletes and politicians. "He was a tremendous bolt of lightning, created by Mother Nature out of thin air, a fantastic combination of power and beauty," comedian Billy Crystal said. James called Ali "the first icon," and announced in November he planned to donate $2.5 million to support a museum exhibit honoring the former heavyweight champion. He also is producing a documentary on Ali for HBO. It was quite a year for James, who powered Cleveland to its own comeback from a 3-1 deficit against Golden State for the city's first major professional sports championship since 1964. He tried to cheer the Indians to a second title for Cleveland, but they fell just short. A day after Game 7, a hungover and hungry crew of Epstein, general manager Jed Hoyer and a couple friends were back at Wrigley Field when they decided to get something to eat. The main dish was fitting. "We enjoyed some warm goat and cold beer," Epstein said. "It was a nice way to celebrate and flush the whole curse narrative once and for all." It took 108 years, but the Chicago Cubs are World Series Champions after a nail-biting, extra-inning Game Seven. The curse is no more. 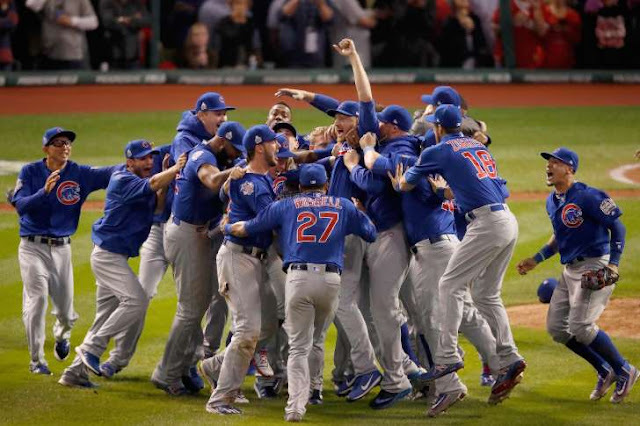 CHICAGO (AP) — Everything changed for the Chicago Cubs on a rainy November night. A century-plus worth of heartache washed away by a wave of pure joy. Everything changed for the Chicago Cubs on a rainy November night. A century-plus worth of heartache washed away by a wave of pure joy. Lovable losers, no more. The story of so many lifetimes is The Associated Press’ Sports Story of the Year. “The burden has been lifted,” manager Joe Maddon said. The Cubs’ first World Series title since 1908 is the runaway winner for top sports story of 2016, collecting 48 of 59 first-place votes and 549 points in balloting by AP members and editors. The death of Muhammad Ali after a long battle with Parkinson’s disease was second with 427 points, and LeBron James leading the Cleveland Cavaliers to the franchise’s first NBA title took third with 425 points. In a year that seemed to be more about what we lost (Ali, Arnold Palmer, Gordie Howe, Pat Summitt, Jose Fernandez and the plane crash that killed most of the Brazilian club soccer team Chapecoense) than the winners on the field, the Cubs provided a feel-good moment that warmed at least the north side of Chicago well into the city’s notoriously brutal winter. They drew huge ratings throughout the playoffs, with much of the country tuning in to see if it finally was the year. As baseball stories go, the 2016 Cubs had it all. One last stand for David Ross, a retiring catcher who became a key figure in Chicago’s clubhouse. Loads of bright young stars, with Kris Bryant turning in an MVP performance. An eccentric personality in Maddon, who cemented his status as one of the game’s best managers. There was history, for the franchise and its front office, with Epstein helping end two of baseball’s biggest droughts. See Boston Red Sox, 2004. That would have been enough to make it one of the top sports stories of any year, but an epic finish only added to the luster of the franchise’s third championship. The Cubs dropped three of the first four games in the World Series against the Indians, and then rallied to force Game 7 in Cleveland. Ali was mourned all over the world after his death in June at age 74. President Barack Obama called his wife, Lonnie, to express his condolences, and a public memorial in the boxer’s hometown of Louisville, Kentucky, drew an eclectic mix of celebrities, athletes and politicians. “He was a tremendous bolt of lightning, created by Mother Nature out of thin air, a fantastic combination of power and beauty,” comedian Billy Crystal said. James called Ali “the first icon,” and announced in November he planned to donate $2.5 million to support a museum exhibit honoring the former heavyweight champion. He also is producing a documentary on Ali for HBO. It was quite a year for James, who powered Cleveland to its own comeback from a 3-1 deficit against Golden State for the city’s first major professional sports championship since 1964. He tried to cheer the Indians to a second title for Cleveland, but they fell just short. 0 Response to "Cubs' World Series title voted top AP sports story of 2016"